They say they love his advocacy for the environment, his intellect and sense of humor. The people urging Al Gore to run for president have not persuaded him to do so - not yet anyway. The latest salvo from those hoping Gore would reprise his 2000 run for the White House came in a full-page ad in The New York Times sponsored by draftgore.com, which says it is a group of grass-roots Democrats. 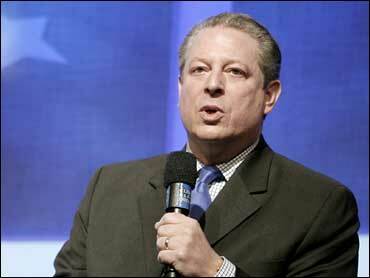 Gore has said repeatedly, if not definitively, that he is not planning to seek the presidency. "Your country needs you now - as do your party and the planet you are fighting so hard to save," said Wednesday's ad, which group founder Monica Friedlander of Oakland, Calif., said cost $65,000. Despite no overt campaigning for the presidency, Gore was backed by 12 percent of Democrats in this month's Associated Press-Ipsos poll. That's down from 20 percent in June, but enough to tie for third with former Sen. John Edwards, well behind Sen. Hillary Rodham Clinton and just trailing Sen. Barack Obama. "Doggone him," Pat Sutton, 69, a Gore supporter and homemaker from Lincoln, Neb., said of Gore's non-candidacy. "That's the kind of president I want, who's willing to stand up to the hard stuff. And there's a lot of hard stuff out there." "He's far and away more intelligent than the others," said Jason Thompson, 36, an environmental health inspector in Fort Myers, Fla. "I like his environmental stand, I think he's the more sincere of the candidates, and I think he got hosed in his first election" when George W. Bush defeated him in 2000 in a disputed election. Longtime political aide Roy Neel, who runs Gore's office in Nashville, Tenn., said the former vice president is focusing on prompting action against global warming. He said he has seen no signs Gore is contemplating a race. "He's making no plans, and we're doing nothing," said Neel, adding, "He's not ruled it out in the future." Asked what "the future" meant, Neel said, "Sometime later than today." Donna Brazile, campaign manager for Gore's bitter 2000 loss to Bush, said she believes he will not run - this time. "He's very comfortable and committed" to his work on global warming, she said, and to business pursuits that include Current TV, a cable network he helped found. She would not rule out a future presidential run. "Al Gore should be viable for the rest of his life" as a candidate, she said. Gore has been in the public eye this year, particularly in February when the movie "An Inconvenient Truth" about his efforts to educate about global warming won the Oscar for best documentary. Current TV also captured an Emmy. Friends hope a crowning third award will come later this week, when the Nobel Prize for peace is announced.